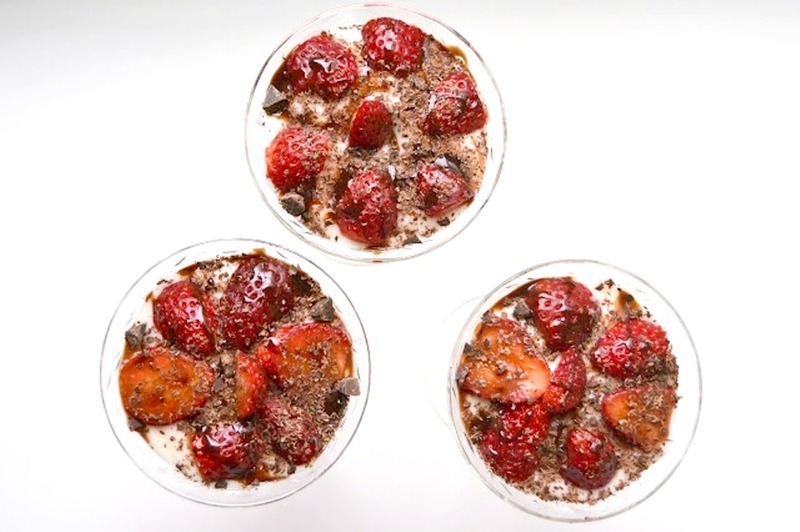 These Strawberry and Chocolate Parfaits only take 10 minutes to make and is healthier than many desserts made with yogurt, strawberries and chocolate! One of my biggest passions is taking a recipe that is not healthy and making it healthier. If I could do that for a living, I would (oh wait, I kind of do!). For these strawberry and chocolate parfaits, I wanted to make a romantic dessert for Valentine's day that tasted great but was not too indulgent. It got the stamp of approval from the two loves of my life: my husband and daughter. What I loved is that they look fairly impressive but are very easy to make. It took me maybe 10 minutes to put these together. 1. Mix 1 cup of yogurt with protein powder and set aside. 2. Layer vanilla yogurt, chocolate yogurt and strawberries in a glass of choice. Top with sliced strawberries, chocolate shavings and chocolate syrup. You can serve immediately or store in the fridge for 1-2 days. Enjoy!